As Justin mentioned last week, the Math Munch team had a blast at the MOVES conference last week. I met so many lovely mathematicians and learned a whole lot of cool math. Let me introduce you to Carolyn Yackel. 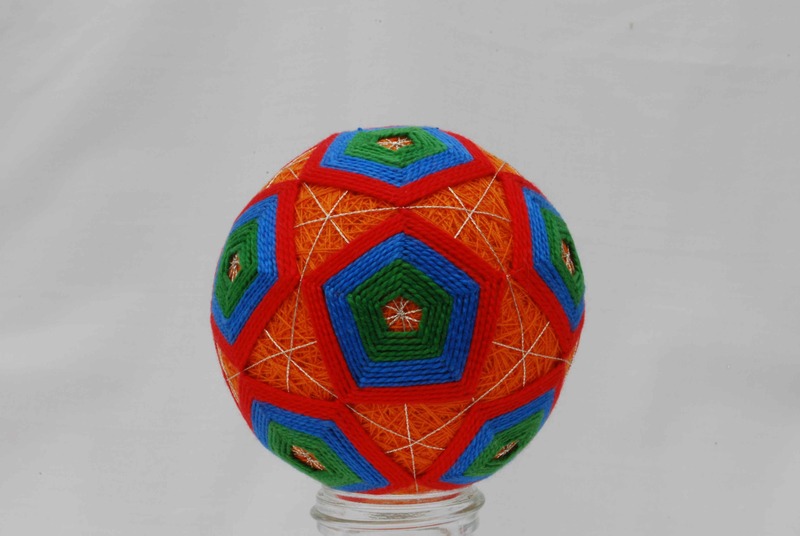 She’s a math professor at Mercer University in Georgia, and she’s also a mathematical fiber artist who specializes in the beautiful Temari balls you can see below or by clicking the link. Carolyn has exhibited at the Bridges conference, naturally, and her 2012 Bridges page contains an artist statement and some explanation of her art. Temari is an ancient form of japanese folk art. 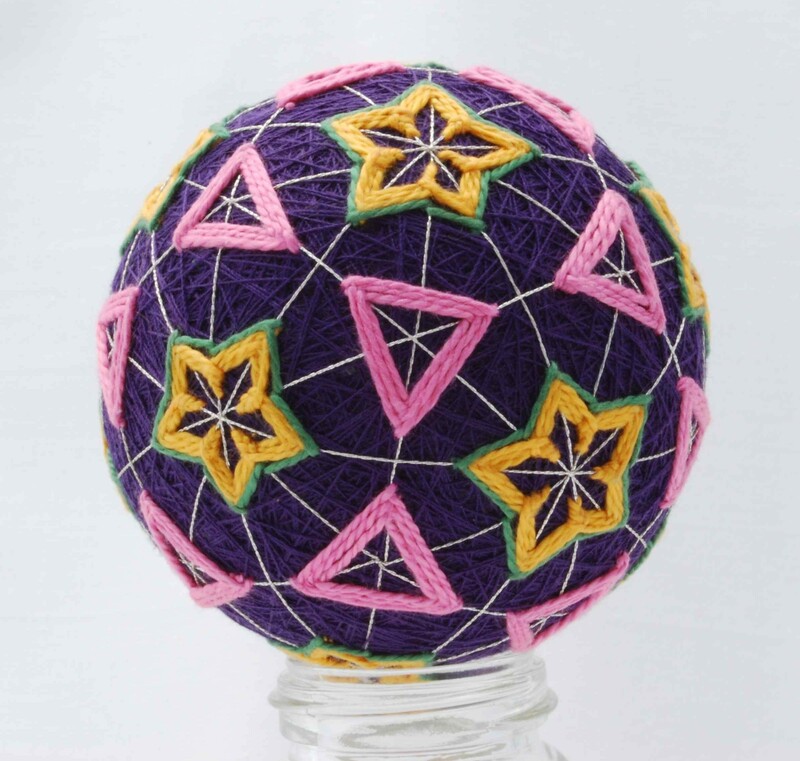 These embroidered balls feature various spherical symmetries, and part of Carolyn’s work has been figure out how to create and exploit these symmetries on the sphere. I mean how do you actually make it that symmetric? Can you see in the pictures above how the symmetry of the Temari balls mimic the Archimedean solids? 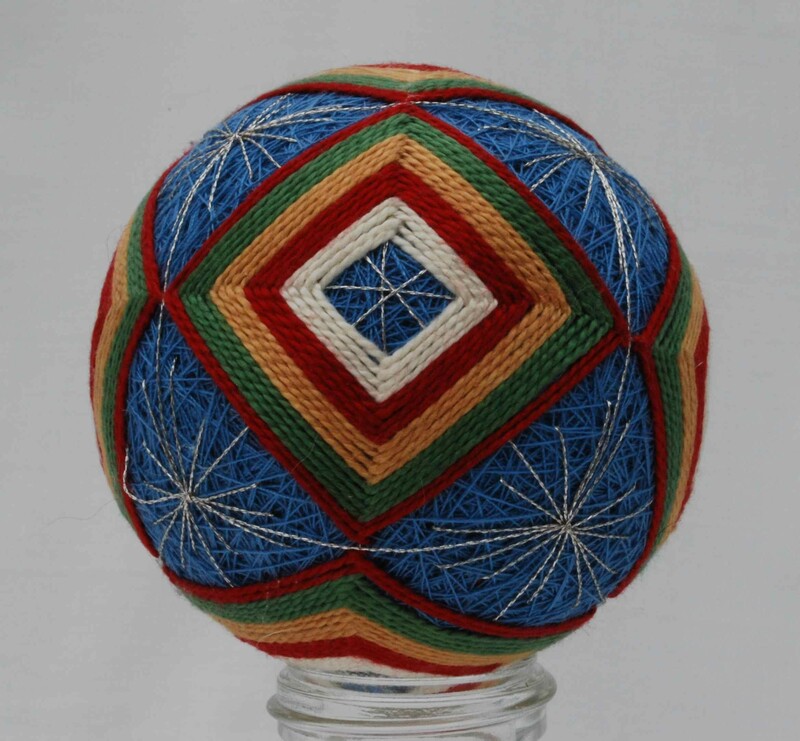 Carolyn has even written about using Temari to teach mathematics, some of which you can read here, if you like. Read Carolyn Yackel’s Q&A with Math Munch. Up next, you may remember Edmund Harriss from this post, and you might recall Desmos from this post. Well the two have come together! On his blog, Maxwell’s Demon, Edmund shared a whole bunch of interactive graphs from Desmos, in a post he called “Form Follows Function.” Click on the link to read the article, and click on the images to get graphs full of sliders you can move to alter the images. In fact, you can even alter the equations that generate them, so dig in, play some, and see what you can figure out. Finally, I want to share a piece of music I really love. “Clapping Music” was written by Steve Reich in 1972. It is considered minimalist music, perhaps because it features two performers doing nothing but clapping. If you watch this performance of “Clapping Music” first (and I suggest you do) it might just sound like a bunch of jumbled clapping. But the clapping is actually built out of some very simple and lovely mathematical patterns. Watch the video below and you’ll see what I mean. Did you see the symmetries in the video? I noticed that even though the pattern shifts, it’s always the same backwards as forwards. And I also noticed that the whole piece is kind of the same forwards and backwards, because of the way that the pattern lines back up with itself. Watch again and see if you get what I mean. Bonus: Math teacher, Greg Hitt tweeted me about “Clapping Music” and shared this amazing performance by six bounce jugglers!!! It’s cool how you can really see the patterns in the live performance. I hope you find something you love and dig in. Bon appetit! Did you see the Google doodle on Monday? This medley of Platonic solids, graphs, and imaginary numbers honors the birthday of mathematician and physicist Leonhard Euler. 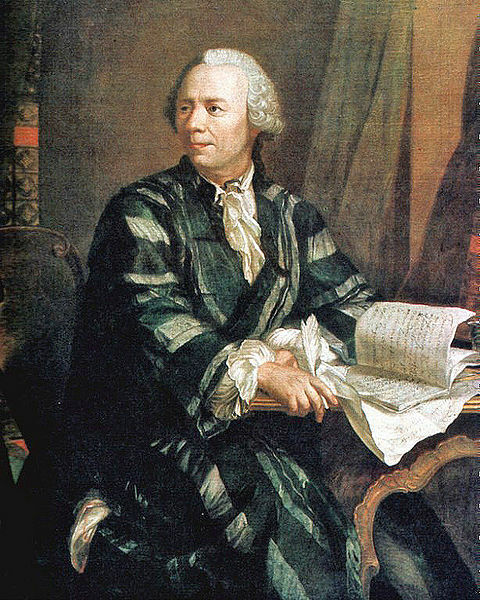 (His last name is pronounced “Oiler.” Confusing because the mathematician Euclid‘s name is not pronounced “Oiclid.”) Many mathematicians would say that Euler was the greatest mathematician of all time – if you look at almost any branch of mathematics, you’ll find a significant contribution made by Euler. Euler was born on April 15, 1707, and he spent much of his life working as a mathematician for one of the most powerful monarchs ever, Frederick the Great of Prussia. In Euler’s time, the kings and queens of Europe had resident mathematicians, philosophers, and scientists to make their countries more prestigious. The monarchs could be moody, so mathematicians like Euler had to be careful to keep their benefactors happy. (Which, sadly, Euler did not. After almost 20 years, Frederick the Great’s interests changed and he sent Euler away.) But, the academies helped mathematicians to work together and make wonderful discoveries. Mathematicians have searched so far in vain to discover some order in the progression of prime numbers, and we have reason to believe that it is a mystery which the human mind will never be able to penetrate… This situation is all the more surprising since arithmetic gives us unfailing rules, by means of which we can continue the progression of these numbers as far as we wish, without however leaving us the slightest trace of any order. Want to work, like Euler did, on important math problems that will stretch you to make connections and discoveries? Check out Project Euler, an online set of math and computer programming problems. You can join the site and, as you work on the problems, talk to other problem-solvers, contribute your solutions, and track your progress. The problems aren’t easy – the first one on the list is, “Find the sum of all the multiples of 3 and 5 below 1000” – but they build on one another (and are pretty fun). Pants made from a crocheted model of the hyperbolic plane, by Daina Taimina. Finally, if someone asked you what a pair of pants is, you probably wouldn’t say, “a sphere with three open disks removed.” But maybe you also didn’t know that pants are important mathematical objects! I ran into a math problem involving pants on Math Overflow (previously). Math Overflow is a site on which mathematicians can ask and answer each other’s questions. The question I’m talking about was asked by Tony Huynh. He knew it was possible to turn pants inside-out if your feet are tied together. (Check out the video below to see it done!) Tony was wondering if it’s possible to turn your pants around, so that you’re wearing them backwards, if your feet are tied together. Is this possible? Another mathematician answered Tony’s question – but maybe you want to try it yourself before reading about the solution. Answering questions like this about transformations of surfaces with holes in them is part of a branch of mathematics called topology – which Euler is partly credited with starting. A more mathematical way of stating this problem is: is it possible to turn a torus (or donut) with a single hole in it inside-out? Here’s another video, by James Tanton, about turning things inside-out mathematically. P.S. 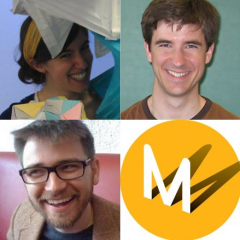 – The Math Munch team will be speaking next weekend, on April 27th, at TEDxNYED! We’re really excited to get to tell the story of Math Munch on the big stage. Thank you for being such enthusiastic and curious readers and allowing us to share our love of math with you. Maybe we’ll see some of you there! I could have used these words of wisdom from George when I was thinking about the problem he poses in this video: “Don’t let your knowledge of mathematics artificially limit what you think is physically possible. Quite to the contrary! Mathematics is a tool which can empower us to do amazing things that no one has ever done before.” Well said, George! Speaking of using mathematics to do and make amazing things, check out this website of modular origami models and patterns! This site was put together by Michal Kosmulski, who lives in Poland and works in information technology. In addition, however, he folds these amazing modular origami polyhedra, fractals, and other awesome mathematical objects! Michal’s site is full of pictures of his modular origami creations and links to patterns for how to make them yourself as well as information about the mathematics behind the objects. He has also included some useful tips on how to make the more challenging shapes. Finally, all the talking about dimensions that we’ve been doing for the past few weeks reminded me of my favorite video about higher dimensions. It’s called, “Imagining the Tenth Dimension,” and it shows a way of thinking about dimensions, from the zero dimension all the way up to the tenth. I can watch this video again and again and still find it mind-blowing and fascinating. Meet Jason Davies, a freelance mathematician living in the UK. Growing up in Wales (one of the 4 countries of the United Kingdom) his classes were taught in Welsh. This makes Jason one of only about 611,000 people that speak the language, only 21.7% of the population of Wales! Imagine if only 1/5 of France spoke French!! These statistics are from a 2004 study, so the numbers may have changed a bit, but they still say something interesting don’t they? Jason is all about what numbers and pictures can tell us. Since graduating from Cambridge, he’s been doing all sorts of data visualization and computer science on his own for various companies and IT firms. I originally found Jason through a link to his Prime Seive visualization, but take a look at his gallery and you’re bound to find something beautiful, interesting, interactive, and cool. I’ve linked to some of my favorites below. MM: What’s the most important trait for a mathematician to have? Is there one? JD: Persistance is always useful in maths! I think the stereotype is to be analytical and logical, but in fact there are many other traits that are highly important, for instance communication skills. Mathematics is passed on from person to person, after all, so being able to communicate ideas effectively is dynamite. MM: Do you have a message you’d like to give to young mathematicians? JD: The world needs you! Read the rest in our Q&A with Jason Davies, and you can see all of our interviews on the Q&A page we’ve just created. I’d die to have an office like this! It gets better. Cristóbal added a page explaining all of the wonderful maths in the video. Click to read about Platonic solids, tilings, tangrams, and various works of art by M.C. Escher. Finally, a nifty new game that explores the relationship between graphs and different kinds of motion. Super Ultimate Graphing Challenge is a game developed by Physics teacher Matthew Blackman to help his students understand the physics and mathematics of motion. You might not understand it all when you start, but keep playing and see what you can make of it. If you need a bit of help or have something to say, post it in our comments, and we’ll happily reply. You’ve probably seen Venn diagrams before. They’re a great way of picturing the relationships among different sets of objects. But I bet you’ve never seen a Venn diagram like this one! That’s because its discovery was announced only a few weeks ago by Frank Ruskey and Khalegh Mamakani of the University of Victoria in Canada. The Venn diagrams at the top of the post are each made of two circles that carve out three regions—four if you include the outside. Frank and Khalegh’s new diagram is made of eleven curves, all identical and symmetrically arranged. In addition—and this is the new wrinkle—the curves only cross in pairs, not three or more at a time. All together their diagram contains 2047 individual regions—or 2048 (that’s 2^11) if you count the outside. Frank and Khalegh named this Venn diagram “Newroz”, from the Kurdish word for “new day” or “new sun”. Khalegh was born in Iran and taught at the University of Kurdistan before moving to Canada to pursue his Ph.D. under Frank’s direction. “Newroz” to those who speak English sounds like “new rose”, and the diagram does have a nice floral look, don’t you think? You can click these links to read more of my interviews with Frank and Khalegh. I enjoyed reading about the discovery of Newroz in these articles at New Scientist and Physics Central. And check out this gallery of images that build up to Newroz’s discovery. Finally, Frank and Khalegh’s original paper—with its wonderful diagrams and descriptions—can be found here. A single closed curve—or “petal”— of Newroz. Eleven of these make up the complete diagram. A Venn diagram made of four identical ellipses. It was discovered by John Venn himself! For even more wonderful images and facts about Venn diagrams, a whole world awaits you at Frank’s Survey of Venn Diagrams. On Frank’s website you can also find his Amazing Mathematical Object Factory! Frank has created applets that will build combinatorial objects to your specifications. “Combinatorial” here means that there are some discrete pieces that are combined in interesting ways. Want an example of a 5×5 magic square? Done! 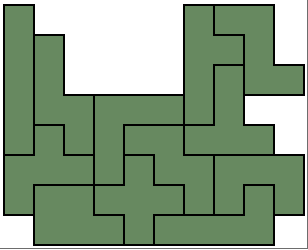 Want to pose your own pentomino puzzle and see a solution to it? No problem! Check out the rubber ducky it helped me to make! Finally, Frank mentioned that one of his early mathematical experiences was building hexaflexagons with his father. This led me to browse around for information about these fun objects, and to re-discover the work of Linda van Breemen. Here’s a flexagon video that she made. And here’s Linda’s page with instructions for how to make one. Online, Linda calls herself dutchpapergirl and has both a website and a YouTube channel. Both are chock-full of intricate and fabulous creations made of paper. Some are origami, while others use scissors and glue. I can’t wait to try making some of these paper miracles myself! It’s my turn now to post about how much fun we had at Bridges! One of the best parts of Bridges was seeing the art on display, both in the galleries and in the lobby where people were displaying and selling their works of art. We spent a lot of time oogling over the 3D printed sculptures of Henry Segerman. Henry is a research fellow at the University of Melbourne, in Australia, studying 3-dimensional geometry and topology. The sculptures that he makes show how beautiful geometry and topology can be. These are the sculptures that Henry had on display in the gallery at Bridges. They won Best Use of Mathematics! These are models of something called 4-dimensional regular polytopes. A polytope is a geometric object with flat sides – like a polygon in two dimensions or a polyhedron in three dimensions. 4-dimensional polyhedra? How can we see these in three dimensions? The process Henry used to make something 4-dimensional at least somewhat see-able in three dimensions is called a stereographic projection. Mapmakers use stereographic projections to show the surface of the Earth – which is a 3-dimensional object – on a flat sheet of paper – which is a 2-dimensional object. 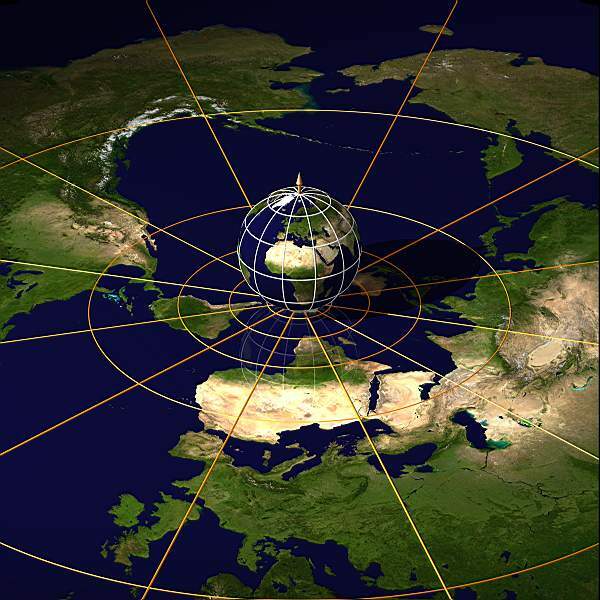 A stereographic projection of the Earth. To do a stereographic projection, you first set the sphere on the piece of paper, or plane. It’ll touch the plane in exactly 1 point (and will probably roll around, but let’s pretend it doesn’t). Next, you draw a straight line starting at the point at the top of the sphere, directly opposite the point set on the plane, going through another point on the sphere, and mark where that line hits the plane. If you do that for every point on the sphere, you get a flat picture of the surface of the sphere. The point where the sphere was set on the plane is drawn exactly where it was set – or is fixed, as mathematicians say. The point at the top of the sphere… well, it doesn’t really have a spot on the map. Mathematicians say that this point went to infinity. Exciting! A stereographic projection like this draws a 3-dimensional object in 2-dimensions. The stereographic projection that Henry did shows a 4-dimensional object in 3-dimensions. 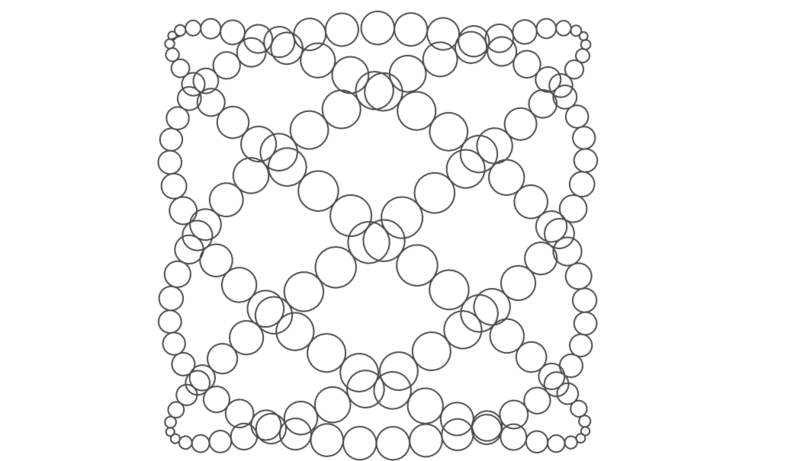 Henry first drew, or projected, the vertices of his 4-dimensional polytope onto a 4-dimensional sphere – or hypersphere. 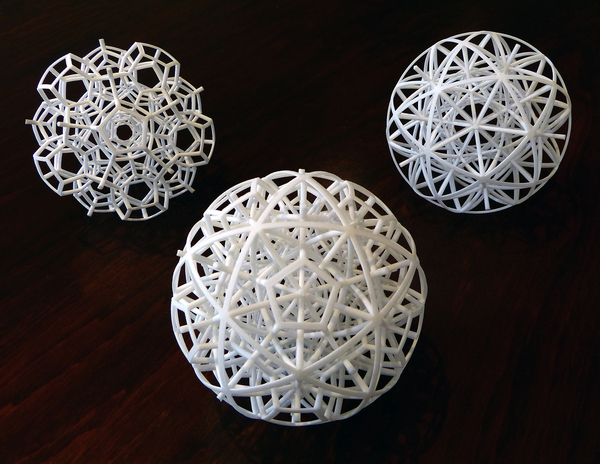 Then he used a stereographic projection to make a 3D model of the polytope – and printed it out! How beautiful! Here are some more images of Henry’s 3D printed sculptures. We particularly love the juggling one. Henry will be dropping by to answer your questions! So if you have a question for him about his sculptures, the math he does, or something else, then leave it for him in the comments. 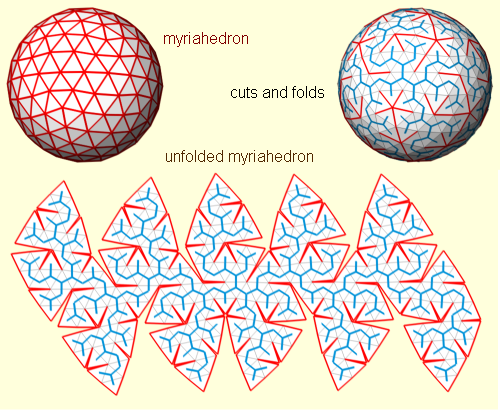 Speaking of polyhedra, check out this site of applets for visualizing polyhedra. You can look at, spin, and get stats on all kinds of polyhedra – from the regular old cube to the majestic great stellated dodecahedron to the mindbogglingly complex uniform great rhombicosidodecahedron. You can also practice your skills with Greek prefixes and suffixes. Finally, two Math Munches ago, we told you about some videos made by the mathematical artist George Hart. He’s the man who brought us the Yoshimoto cube. And now he’s brought us… Pentadigitation. In this video, George connects stars, knots, and rubber bands. Enjoy watching – and trying the tricks!